N.T. Wrong calls me a “liberal” biblioblogger, which I suppose is accurate enough. I tend to be moderately liberal in most areas of my life. Check out his list of active bloggers, each of whom he labels “very conservative”, “fairly conservative”, “liberal”, or “very liberal”. As a blogger said to me last night, Jim Davila being labelled “very liberal” is puzzling. (I would have said “liberal”.) Nor do I understand why Mark Goodacre and Stephen Carlson are considered “fairly conservative”. They’re puzzle solvers more than anything. Is there really anything “conservative” about Q skepticism without Matthean priority, or recognizing Secret Mark as a hoax, or dating Galatians after I Corinthians? They don’t talk politics on their blogs, so that can’t be that issue. Most others whose blogs I read seem right. Michael Bird is pegged as “very conservative”, James Crossley “very liberal”; Chris Heard and Tyler Williams are each “fairly conservative”; April DeConick “very liberal”; Chris Weimer “liberal”, though he team blogs with others who are “fairly conservative”; etc. It’s an interesting exercise. UPDATE: N.T. Wrong clarifies his labels. In this book we find Bird and Crossley in fine form, trading shots over the inadequacies of the other’s account of Christian origins, never budging, never giving in when they disagree, but mercifully engaging instead of talking past each other. It’s a sharp and fun debate, and I honestly can’t say who wins. Two books like this were published back in ’99, but they haven’t aged well. Will the Real Jesus Please Stand Up? (Craig vs. Crossan), and The Meaning of Jesus (Wright vs. Borg), each featured an evangelical debating with a liberal Christian, but seemed chiefly concerned with interfaith dialogue. Bird and Crossley come off more historically disciplined, and the latter is secular, having no interest in Jesus as a confessional figure at all. This is where the rubber meets the road. Crossley has the advantage of starting and ending strong — speaking first and last in the first and last chapters, where he’s at his best — and so on whole he may seem more impressive. But Bird comes off better in the sections on Paul and the gospels, and he ties evenly with Crossley in the resurrection chapter. It’s a bit like watching a boxing match between friends who get floored repeatedly, but are never down for the count. Let’s see how they do. Crossley grounds all of this in Judaism, showing that there’s nothing necessarily “Christian” about any of this. One can hardly argue with his general sketch: Jesus was conceived and born like any other human being (Crossley thinks his father was Joseph; I suspect he was illegitimate, but no matter). His prophetic career was driven and shaped by social upheaval in Galilee; he condemned the rich for no other reason than being rich, and promised a reversal of fortune for the poor. He forecast God’s coming kingdom, but was wrong about that expectation. He was a successful exorcist-healer. He was executed by Jerusalem authorities for raising hell in the temple during a passover festival. He died a martyr, and like other martyrs his death was understood to have atoning value. Right on. The only weakness is Crossley’s claim that Jesus was a completely law-abiding Jew, based on an overwrought distinction between “biblical laws as explicitly stated in the bible” and “the interpretation or expansion of biblical law to new situations” (p 6). While I agree that Jesus was more law-observant than many confessional portraits suggest, “Torah” and “Torah-interpretation” can’t always be kept so neatly distinct. But more on this when we get to the section on the gospels (chapter 4). Bird’s take is transparently confessional, going so far as to defend the virgin birth, that Jesus thought he was divine, and that he wasn’t wrong about the kingdom’s timetable. Crossley’s rejoinder on all these points is right on the money, and as he notes, Bird’s evangelical view makes him more or less obligated to argue this stuff. I was getting a very bad feeling for Bird in this chapter, but thankfully he gets better as the book goes on. Jumping to the end, where Crossley and Bird give alternative accounts of Christianity’s ultimate success, I think the former again shows more argumentative strength. Believers like to hold up what’s theologically distinctive and appealing, but religions usually triumph for more mundane reasons, even accidentally. The west would have probably become Islamic if Charles Martel had lost the Battle of Tours in 732 (think how different the world would be today if a very minor battle had gone the other way). Sociological accounts of Christian origins may not be the most exciting things to read about, but Crossley is right that “Bird’s near-complete reliance on ideas and individual influence is odd and outdated” (p 166). I do agree with Bird that Christian monotheism began as early as Paul and probably before (on which see below), but Crossley is right that it wasn’t Jewish friendly (in my view it was a radical if understandable mutation) but found ready welcome in the Gentile world. I also think Crossley, following Casey, is at least persuasive about why Jesus was only later understood to be God in the strongest and most explicit sense: “changing social situations and the perception of socio-ethnic alienation from the Jewish community, just like the conflicts underlying John’s gospel” (p 148), on top of a pagan milieu where monotheism was fluid and had a long tradition within the development of agrarian empires. If Judaism had been more missionary and less ethnic/kinship-oriented (as Crossley suggests, p 147), it could well have triumphed over the pagans before (and instead of) Christianity. In short, there was nothing inevitable about Christianity’s triumph owing to theological beliefs. If Crossley is the alpha and omega, Bird is the mu and nu (doesn’t sound flattering, I know), nailing some important ideas that came in-between Jesus and the second century. I should preface this by admitting I don’t agree with Bird’s overall take on Paul — I think the apostle was anti-nomian (despite a few lame protests to the contrary in Romans), while Bird warms to Wrightian ideas about covenant-climaxes, continuity with the OT, and that the law really “hasn’t been done away with” (p 91). That aside, Bird is on top of his game in discussing two crucial topics: Paul’s Christology and his reason for persecuting early Christians. Against Crossley who sees an exalted but not divine Jesus in Paul’s letters, Bird sees the Jewish God himself. I agree that passages like I Cor 8:6 go beyond portraying Jesus as an exalted being, and ditto with Philip 2:6-11, where Jesus is not only exalted but worshipped as the Lord of all creation (which Bird rightly parallels with Isa 45:23). This isn’t to say Paul never waxed ambiguous (or perhaps even uncomfortable) (in I Cor 15 he takes pains to subject the Son to the Father), but for him, Jesus was somehow YHWH. Not a Chalcedonian, granted, but the fifth-century Hellenized deity was easily derived from Paul’s (radically mutated) Jewish personalized understanding of God. I suspect first-century Judaism was ripe for a radical move like this on account of increased personifications. “Who God was” mattered more than “what he was”, says Bauckham; and Witherington has chronicled the development of Wisdom incarnate in various ways (through texts like Ben Sira, Wisdom of Solomon). It was a short step to start meshing the divine and human in creative ways. The “Big Bang” theory of early high Christology (e.g. Richard Bauckham, Larry Hurtado, and Philip Esler) is to be preferred over the gradual evolution theory (e.g. James Dunn, Maurice Casey, and Marinus De Jong). While I agree with Crossley that we don’t get an explicit equation between Jesus and God until John’s gospel, it’s implied nonetheless in Paul’s letters and to a lesser degree the synoptics. Overblown Christology and wacky messianic beliefs, however, doubtfully account for why the early Christians were persecuted so zealously. I’m confident Bird is right that the catalyst for Saul going berserk was the acceptance of Gentiles without requiring circumcision, or in other words, indiscriminate table fellowship (Crossley suggests it was only an “interpretation” of the law calling forth such zeal, to which Bird counters on p 93). Saul’s zeal must have been aimed against those who were visibly threatening the integrity of Judaism with outrageous behavior — not just professing abstract belief in wacky ideas or splitting legal hairs. Christianity was likely admitting uncircumcised Gentiles (few as they were) right from the get-go — and only around 49 were James and Peter beginning to insist otherwise, precisely so they could survive more comfortably in a mainstreamed movement. As Paula Fredriksen explains, millenarian movements have a short half-life by necessity, and the pillars’ move was an entirely understandable one. Paul’s formula may have been destined to prevail in the Diaspora, but not Judea. James was pulling back on a position originally shared with Paul (indiscriminate table fellowship between circumcised and uncircumcised), to fend off threats from any more Sauls who were ready to pounce. That was the issue at Antioch, I believe, which I’ve written about before (see here, for instance), and I agree with every one of Bird’s objections to Crossley (p 94). Antioch was about circumcision (per Esler, Nanos, Watson), not food laws, which is why it’s relevant in the context of Galatians. Paul’s adversaries at Antioch weren’t the “food faction”, but the “circumcision faction”. The issue at Antioch wasn’t about what was eaten, but with whom it was eaten. It’s exactly what Paul had found so offensive as a Pharisee. Jesus himself may have believed he was fulfilling the Torah (everyone interprets their sacred traditions properly in their own minds, don’t they? ), but that’s not the end of the story — anymore than it was for Paul when he claimed his gospel fell in line with the calling of the prophets. His opponents easily denied his claims: what he actually taught was apostacy. Paul, of course, went beyond Jesus and explicitly dethroned the law (and I think he was largely anti-nomian in his own mind), but the analogy regarding perception still holds. If Crossley wants to insist that Jesus was “completely Torah-observant” from Jesus’ own perspective — in the same way that other Jews who found wiggle room for their questionable interpretations were — then fine. But many would agree with that anyway. Crossley is right about the unhistoricity of the resurrection (as if this should need spelling out in a work of history), and Bird is right about the historicity of the empty tomb. Crossley insists that visions alone gave rise to the resurrection belief, based particularly on the account of II Maccabees 7. But as Bird points out (p 68), that’s not an example, because the resurrection is seen as corporate and happening at the end of history — as is every understanding of the resurrection we know of. There was no precedent in Judaism for a single person being raised before the apocalypse, and so (in light of the fact that Jesus’ martyrdom wasn’t seen as a failure), based on visions alone, the disciples would have concluded that Jesus was a ghost or apparition, or that his spirit had been exalted into heaven. Visions coupled with an empty tomb, on the other hand, could have plausibly caused the disciples to revise their expectations. Which they did. The concrete and evidential arguments are the testimony of the women, and the simple fact that the disciples had no reason in the world to invent a premature resurrection (without an empty tomb prodding them in that direction). People create fictions in order to cope with failures and broken dreams, but in an apocalyptic context Jesus’ execution wasn’t seen that way. His crucifixion would have demoralized the disciples but met their expectations just the same. Jesus promised there would be suffering and death in the tribulation period, and it’s a sure bet he foreshadowed his own. His followers would have gone on hoping for the apocalypse, at which point they (and he) would have been resurrected. As Bird notes, citing Allison, “the disciples were emotionally down but not theologically out” (p 45). It was the empty tomb (in conjunction with visions) that caused them to conclude Jesus was raised prematurely. When Bird writes that any answer to the question of how Christianity began “must include the notion that God raised Jesus from the dead” (p 48), he could be taken more seriously by non-evangelicals if he just qualified it with the word “belief”. The belief that God raised Jesus from the dead was important, but historians don’t put two-and-two together the way the disciples did. “Belief,” as Crossley says, “does not prove anything happened, anymore than lots of people believing in God proves God exists.” (p 58) We’ll never know why Jesus’ body vanished — though grave robbing was common enough, especially the corpses of holy/crucified men — but we don’t resort to faith confession to answer historical questions. How Did Christianity Begin? is a debate to learn from, because in the end there’s no clear place to lay your allegiance. 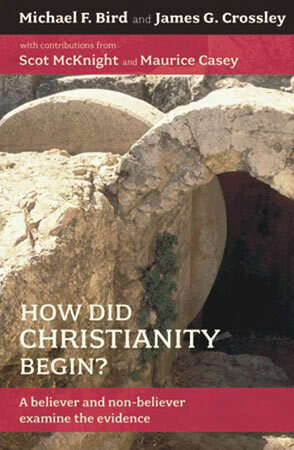 Neither Crossley nor Bird explain Christian origins in a way that completely satisfies, but that’s how it should be. They are each persuasive about a good deal, but about different things, and ultimately about evenly matched. I’m wondering if their discussion indicates that secular historians have an edge on the historical Jesus, evangelicals on the confessional writings of the NT. I seriously doubt it, but that seems to be how it played out in this case. Well, back to the book. I’m enjoying it so far and will eventually have a review up. It turns out that Bird and Crossley each succeed in scoring zingers against each other (the above citation not being an example). Of the three chapters I’ve read, Crossley has the better case in chapter one (the historical Jesus), Bird and Crossley split the victory in chapter two (the resurrection) — Bird for a persuasive case for the historicity of the empty tomb, Crossley for the unhistoricity of the resurrection — and I’m honestly not sure who impresses more in chapter three (the apostle Paul), though I agree more with Bird about particulars, like the Antioch incident and the reasons why Paul persecuted the church. These guys are good debaters. Lorenzo DiTommaso has an RBL review of The Stars Will Fall from Heaven: Cosmic Catastrophe in the New Testament and Its World, by Edward Adams. Wright fans who doubt the conclusive evidence for a literal belief in the end of the world by the time of Jesus really need to read this book. It surveys both Jewish and classical literature, and even ends on a suggestion that environmental responsibility and apocalypticism aren’t necessarily incompatible. I’ve been meaning to review it myself but have been neglecting the blog lately (and reading too much high-brow literary fiction instead). The thirty-fourth Biblical Studies Carnival is up on Doug Chaplin’s MetaCatholic.